Experience the finest apartments in College Station, Texas at Hunters Point Apartments. Our beautiful apartment community offers spacious one and two bedroom floor plan options that are ideal for students looking for affordable housing. Residents of our home-style community enjoy many amenities including a relaxing, outdoor swimming pool and a convenient laundry facility. We take pride in our responsive, on-site property management team, which provides excellent customer service to ensure that your needs and expectations are met. 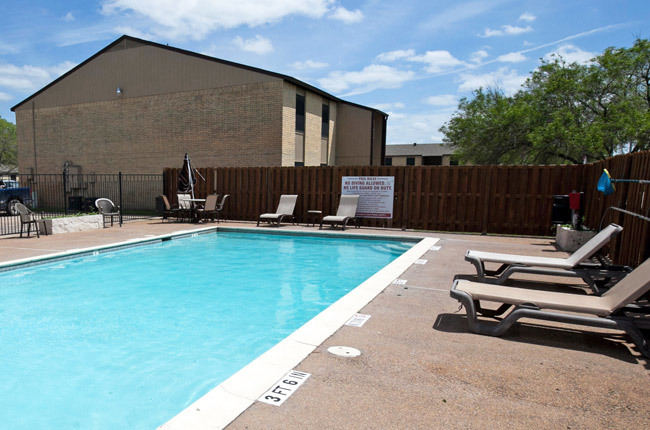 Conveniently located, Hunters Point Apartments equips residents with a central location, featuring close proximity to Texas A&M and its shuttle, restaurants, shopping, and entertainment. If you are looking for the ultimate in maintenance-free apartments in College Station, Texas, come home to Hunter Point Apartments today! Located less than ten minutes from Texas A&M University, Hunters Point Apartments is the perfect location for university students and staff to settle down. The area features a multitude of parks! From Gabbard Park and Brison Park to WAA Tarrow Park and John Crompton Park, it is simple to find a beautiful green space where you can spend a sunny afternoon studying or catching up on some assigned reading. For some weekend fun, there are a number of nightlife opportunities surrounding Texas A&M such as Obannon’s Tap House, Basil Whippet’s Pub, and Fox & Hound. You will never go hungry with the amount of restaurants featured in the area including Coco Loco, which serves up casual Mexican fare, Rosie’s Pho Asian Noodles, and 40 Tempura Sushi Restaurant. Best of all, we feature close proximity to the Texas 6 so commuting throughout the city, or even home for the weekend, should be of relative ease. As far as location is concerned, we have you covered at Hunters Point Apartments.